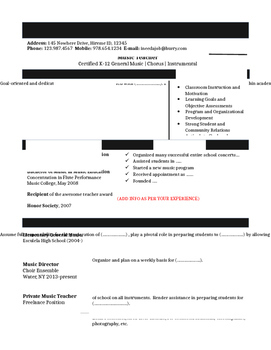 This resume is is a Microsoft word publisher document that is designed specifically for music teachers. Includes specific sections for music teacher qualifications and skills and also includes writing prompts to give you ideas on what to write. NOTE: The preview purposely makes the document look distorted. If you have any problems upon purchasing the document, please let me know.